The 100th day can be an exciting day. Here I have some pictures put together of some activities that we’ve done in the past. These pictures were taken on a year when we broke up into four groups using both our kindergarten and first grade classes. This activity is for someone with either a large room or access to hallway for your use. 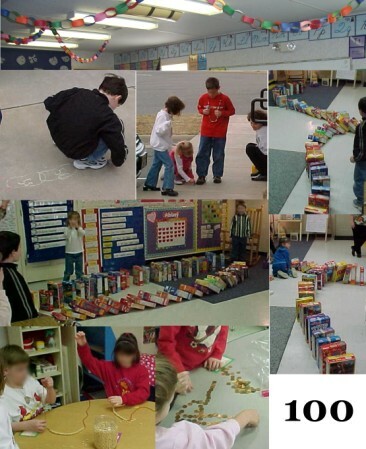 For a couple of weeks before the hundredth day we asked students to bring in cereal boxes. This group of kids did two different things with the cereal boxes. First they had to count them to make sure they had 100 boxes. They could group them by fives, tens, or twenty-fives in order to count the whole easier. After they had them counted the rest of the time was setting them up like dominoes and watching them go! This activity was done outside (of course this is weather permitting). This group had to trace their feet with sidewalk chalk. Since we had four groups then they needed to trace twenty-five feet. Each child traced first one foot then the other, taking turns, until there were twenty-five number ‘shoes’ on the sidewalk. The first group had it easy because they knew that they started with the number one and ended with number twenty-five. The second group could see that they needed to start with twenty-six but they had to think about which number to stop at. The third and fourth groups did likewise. Groups 3 and 4 were done in a different room from the ‘dominoes’. Counting and stringing. We had different cereals or noodles that could be strung. Just like the cereal boxes they had to group by fives, tens, or twenty-fives to count out their objects. Using the manipulatives. They enjoyed counting out 100 of something and then using them to build something. I believe that the favorite that year was building blocks. Here are some alternative ideas. Just remember to have fun on your 100th day! Leave the 100th day page and return to the themes page. Want to know how to build a site like this one? !